In 1883, John Rochfort foresaw the need for this viaduct when he carried out his exploration survey for the route of the North Island Main Trunk (NIMT) Railway in 1883. He realised that the five deeply entrenched rivers flowing westward off Mounts Ruapehu, Ngauruhoe and Tongariro were best crossed directly without deviating the line to avoid more expensive bridging points. 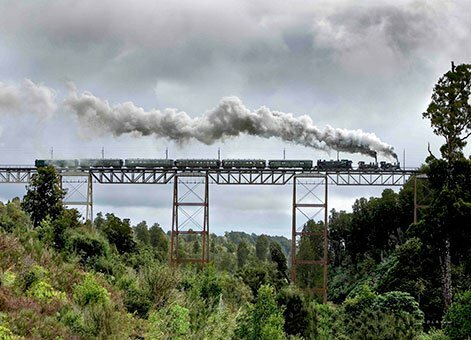 Makatote Viaduct is the last and highest of a family of structures that began with Mangaweka Viaduct (since bypassed and demolished), which conformed to the classic North American steel trestle pattern. All these structures had a series of towers supporting Pratt trusses spanning up to 30 m each. Makatote is 262 m long and 79 m high. The call for tenders for the construction of Makatote Viaduct went out on 15 May 1905. J and A Anderson Limited, of Christchurch, had their tender accepted. The Andersons built a modern, by the standards of the day, factory just north of the Makatote site to fabricate all the steel members needed for the viaduct. Wellington to Auckland 'Special' crossing the Makatote Viaduct, 7 August 2008. Photograph courtesy of D.L.A. Turner. Equipment, materials and stores had to be shipped to Auckland, railed to Oio (north of Raurimu), and carted along a purpose made road (now State Highway 4). As the railhead crept southward, this road haul distance reduced. By autumn 1906, the Andersons had set up their factory, which was powered by a wood-burning boiler and steam engine. It was lit electrically. A water turbine drove the stone crusher and concrete mixer. A cableway had been erected on the centreline of the viaduct. Operation of this was controlled from the viaduct, again by electrical means. Steel fabrication began on 25 June 1906. The last girder was placed on 4 June 1908, allowing the cableway to be dismantled to permit completion of earthworks up to the abutments and subsequent rail track laying. The rail track across it was completed on 3 August 1908. 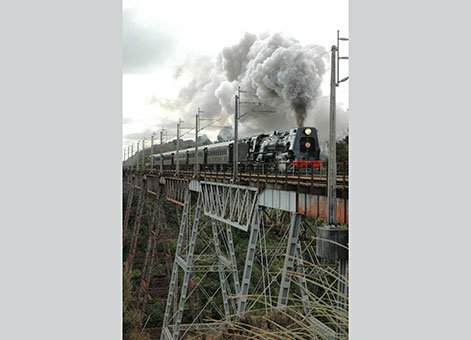 Ka 942 crossing the Makatote Viaduct, 10 August 2008. Photograph courtesy of R. Merrifield. During the period 1925 to 1932 all bridges and viaducts along the NIMT railway were checked and strengthened as necessary to carry locomotives weighing up to 140 tons and having maximum axleloads of 14 tons. Subsequently, in the 1983 to 1989 period, further modifications were carried out to take the greater axleloads of 18 tonnes and higher tractive forces of electric locomotives now used on this route. At the same time, brackets were fitted on one side of the viaduct to carry concrete electrification masts. One foundation was underpinned with deeper foundations in 2008, to protect the structure from scour of the stream bed. Railway viaduct at Makatote under construction . The Press (Newspaper): Negatives. Ref: 1/1-009767-G. Alexander Turnbull Library, Wellington, New Zealand. 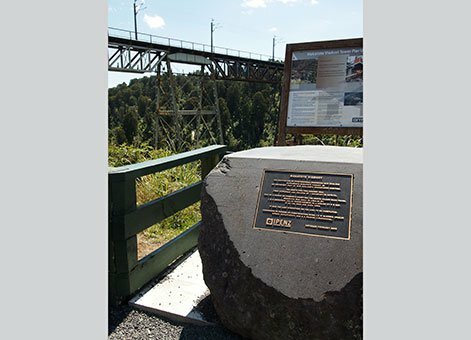 IPENZ recognised the engineering heritage value of the Makatote Viaduct with a plaque unveiled February 2009. 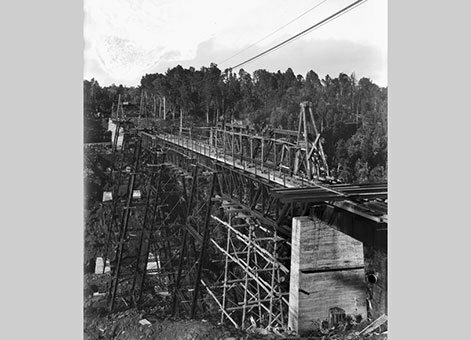 Makatote Viaduct: New Zealand Heritage List/Rarangi Korero information. North Island Main Trunk (NIMT) Historic Area: New Zealand Heritage List/Rarangi Korero information. Engineering Heritage plaque at Makatote Viaduct, February 2013. Engineering New Zealand. In 2017 London-based IStructE, The Institution of Structural Engineers, awarded Opus International Consultants the ‘Award for Structural Heritage’ for their rejuvenation of the viaduct. Traveling on SH 4 the viaduct is highly visible. There is a good place to view the viaduct on the road side on the south side of the valley. This structure is part of an operational railway and therefore direct access is prohibited. R S Fletcher, Single Track, The Construction of the North Island Main Trunk Railway, Collins, Auckland, 1978. A L R Merrifield, 'New Zealand’s North Island Main Trunk Railway: 1870-1908,' Proceedings of the Institution of Civil Engineers, Vol 162, Issue EH4, November 2009. A L R Merrifield, 'A Centennial Review of the North Island Main trunk Railway: Geology of the West-Central North Island and its Influence on Transport Development,' Proceedings of 3rd Australasian Engineering Heritage Conference, 2009. Bill Pierre, North Island Main Trunk, An Illustrated History, Reed, Wellington, 1981. F K Roberts, A Compendium of Railway Construction, Part II, North Island Main Trunk, New Zealand Railway & Locomotive Society, Wellington, 1990. Permission of the Alexander Turnbull Library, Wellington, New Zealand, must be obtained before any re-use of this image. The viaduct is 8 kilometres south of National Park village, Central Plateau, on State Highway 4 (SH4). The highway passes under the viaduct twice.